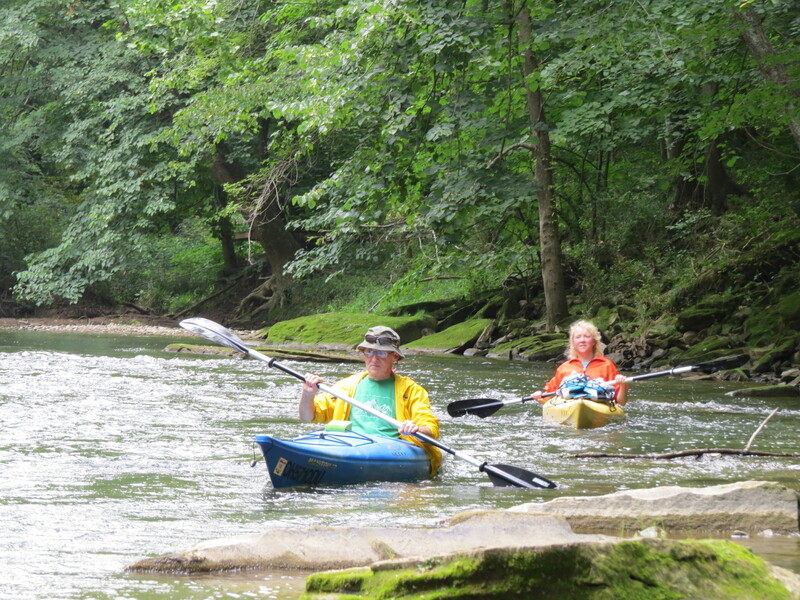 When you paddle Clear Fork of the Mohican River, chances are you won’t have company. Unless you bring your own. 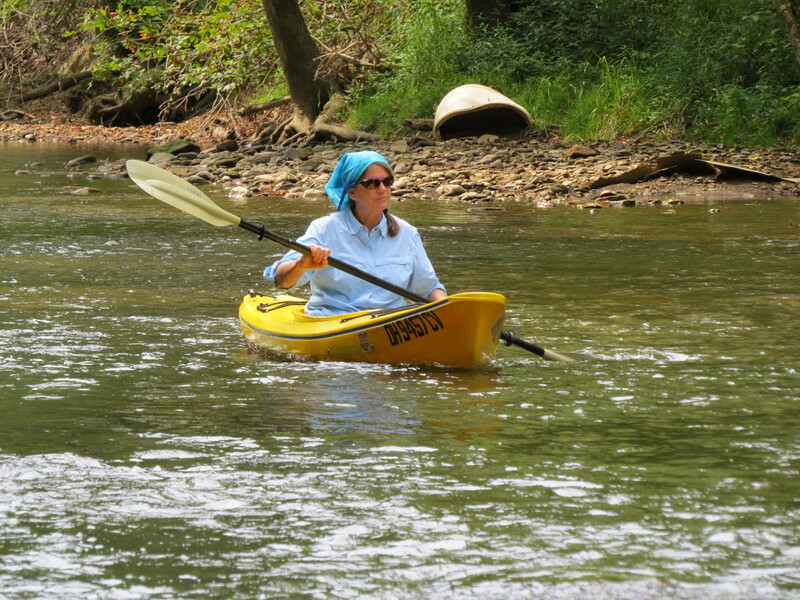 That’s what I did in late July, when I canoed Clear Fork from west of I-71 to Pine Run. 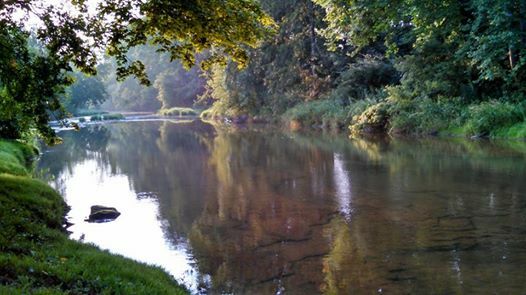 The trip covered more than half of the 36-mile river, stopping just short of its confluence with Black Fork south of Loudonville. Annette McCormick and Kevin and Theresa Clark joined me for part of the journey. As mentioned in the previous article, Clear Fork has much to offer in terms of sightseeing and recreational opportunities, but it’s usually too shallow to paddle. At the other extreme, Clear Fork can be treacherous, even for experienced paddlers. It’s a narrow and winding river with an abundance of boulders and fallen trees. But, when the water level is just right, paddling Clear Fork can be a rewarding experience. Annette and the Clarks joined me in Bellville, after I’d finished bushwhacking my way down the river from Kochheiser Road off State Route 97. Annette paddled with us as far as Butler, about 5 ½ miles. The Clarks stuck it out for two more days of paddling and camping. We opted to set up two base camps along the way so we didn’t have to haul our gear down the shallow river. The water level was up slightly from recent rains, but not enough that we didn’t have to get out of our boats and wade occasionally. I used my solo canoe, the others had kayaks. I had scouted the river by car earlier in the month and decided the Kochheiser Road bridge looked like a promising put-in point for the bushwhacking part of the trip. I had paddled from Bellville to Loudonville on several occasions — some day trips and some overnighters — but had never been on the river upstream of Bellville. I started late in the morning and the plan was to meet the others in Bellville that afternoon. I “guesstimated” that it would take three hours to paddle, drag and carry my canoe the five-plus miles from Kochheiser Road. It proved to be a lucky guess. As I approached the State Route 13 bridge in Butler, Annette, Kevin and Theresa were unloading the kayaks from their vehicles. I had been on the river just over three hours. About half that time had been spent lifting the canoe over downed trees or lining it around narrow chutes where the current would have otherwise jammed it into a strainer. For the uninitiated, lining is the practice of using a rope from the bank to guide a boat through dangerous water. A strainer is debris in the river, generally tree parts clustered together, that allow water through but not solid objects — such as human bodies. The river is very narrow in this section, less than 20 feet wide at times. There are about a half-dozen tiny islands and, in some cases, the channels going around the islands are barely six feet wide. Clear Fork does a lot of twisting and turning and this stretch is no exception. Because of this, the scenery tends to change abruptly. With the exception of the I-71 underpass, most of it is pleasant to look at. Like most of Clear Fork, it flows through forests and farmland. Clear Fork at Mock Road. Watch out for the barbed wire! I wanted to bushwhack this section for two reasons — to see what was up there and to determine how much of it was suitable for paddling. I concluded that, for the adventurous paddler, Clear Fork at the level I ran it is navigable from Mock Road down. The river widens out and becomes deeper at this point and the bends are more gradual. That said, I’d advise caution when putting in at Mock Road. 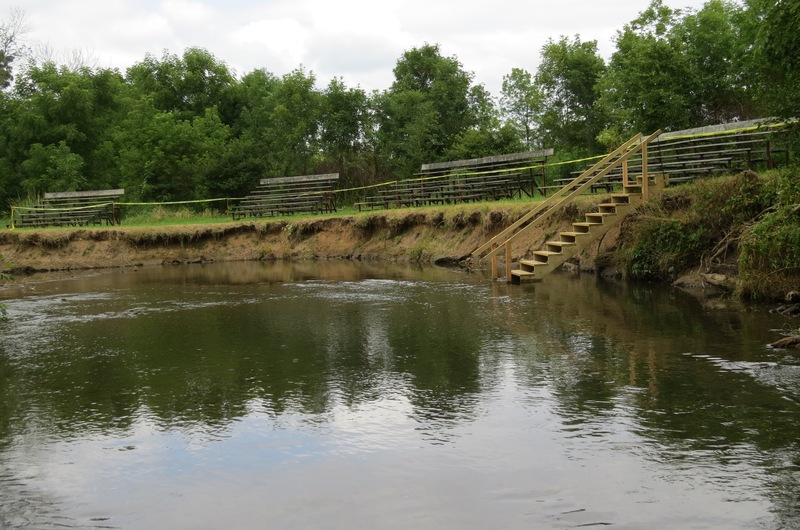 A landowner has strung two strands of barbed wire across the river there and a little further downstream. I love canoeing because it’s full of surprises and this trip was no exception. A little over a half-mile downstream of Mock Road, I came around a right turn in the river and into a sweeping bend. The high bank on the left side of the river was lined with bleachers. At the end of all this was a wide wooden staircase descending into the water. I’ve never thought of canoeing as a spectator sport, so I figured the bleachers and steps had been placed there for a different reason. After I’d paddled a mile downstream, the proverbial light bulb flickered on inside my skull: Baptism! After the trip, I checked on the Internet and found that CitiChurch on State Route 97 was located in the general vicinity. I contacted Adam Drinkard, a team pastor with the church, and he confirmed that the bleachers and steps had been put there for river baptism. He and Tricia E. Kehl, the CitiChurch administrative assistant, told me the bleachers had been moved there from ball diamonds on the property last year with plans to conduct annual baptisms in the river. More than 200 people have been baptized there so far. This year’s mid July baptism was so well-received, a second one was planned for August. Hours later, I experienced another first in my 34-year paddling career, this time with Annette, Kevin and Theresa. Is canoeing a spectator sport? After a glorious afternoon on the river, we were getting close to our first campsite at River Trail Crossing outside of Butler. At Gatton Rocks, a local landmark mentioned in the previous article on Clear Fork, we happened upon a high school senior photo shoot in progress. 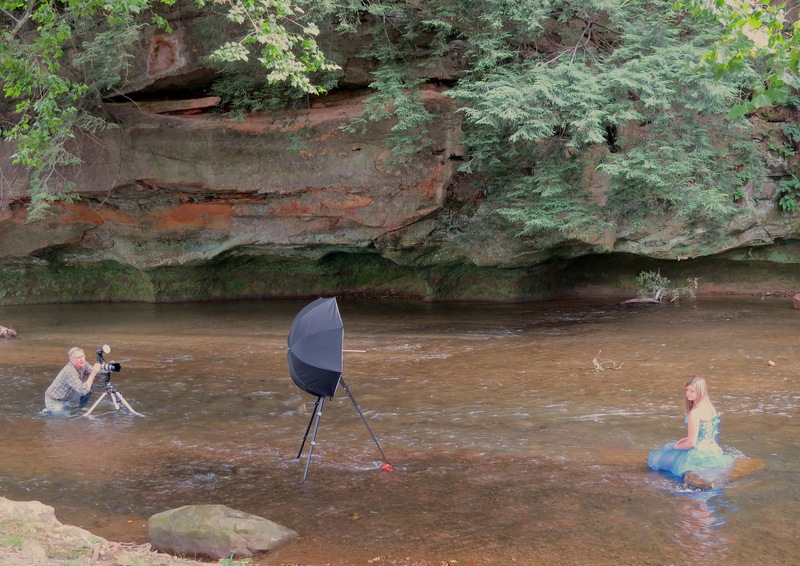 It was quite a spectacle with the heavy-duty camera tripod and massive light reflector set up in the river beneath a huge sandstone outcropping. The photographer, Mark Bohland of Lexington, skillfully worked with his young subject, putting her at ease and coaching her on how to look natural while posing. We could have paddled through but decided to wait until they were done. We introduced ourselves and they were comfortable with us being there. After a costume change, the shooting continued. The subject, Caitlin Goad, 17, of Lexington High School, wore a frilly blue sequined dress. Apparently the dress wasn’t as delicate as it looked. It took a bit of a soaking, but looked none the worse for wear. 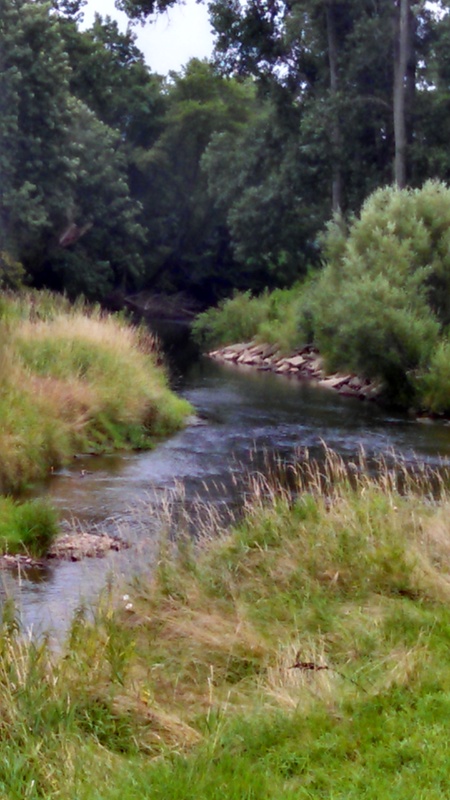 We continued on our way and, just upstream from the campground, a bald eagle soared across the river in front of us. It was a fitting end to a remarkable day on the river. In the morning I treated Kevin and Theresa to another one of my campfire specialties, tomato and basil omelets with fresh homegrown ingredients. Basil travels surprisingly well on the river if you know how to do it right. I use one of two techniques: I either take along a small potted plant or I clip branches off a mature plant, place them in beer bottles filled with water and place the bottles in a six-pack carrier. The carrier, when wedged in among your gear, prevents the bottles from tipping over in the canoe. I suppose I could push it to extremes by bringing laying hens along, but I rely on store-bought eggs for that part of the meal. The river gods smiled upon us that day. Rain was in the forecast and we heard thunder in the distance all afternoon, but all the storms passed around us with nary a drop of rain. 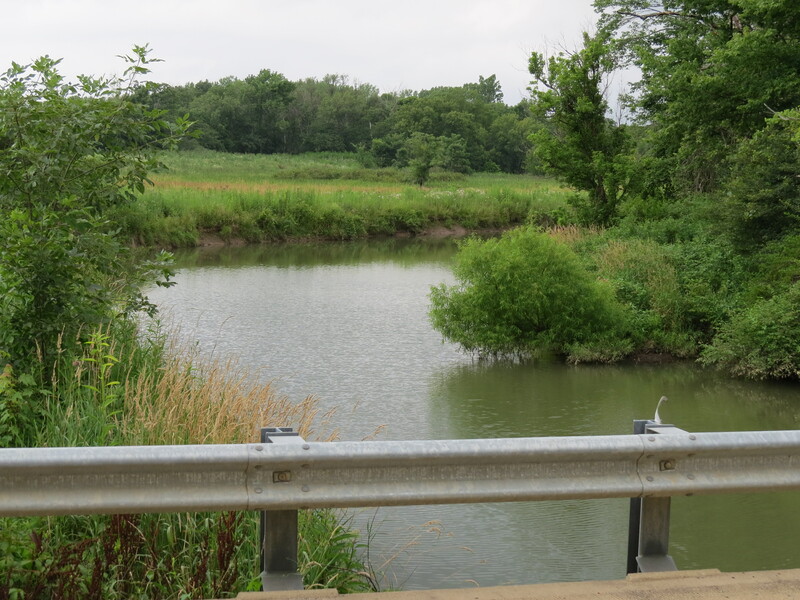 Some of the finest scenery and wildlife-watching on Clear Fork is between Butler and Pleasant Hill Lake. The river meanders through a wide forested valley with plenty of fascinating rock outcroppings along the banks. In this section in particular, the river lives up to its name and you can see fish scurrying away as your boat approaches. I’m not sure, but I think our stirring up the fish made us popular with the green herons and belted kingfishers. 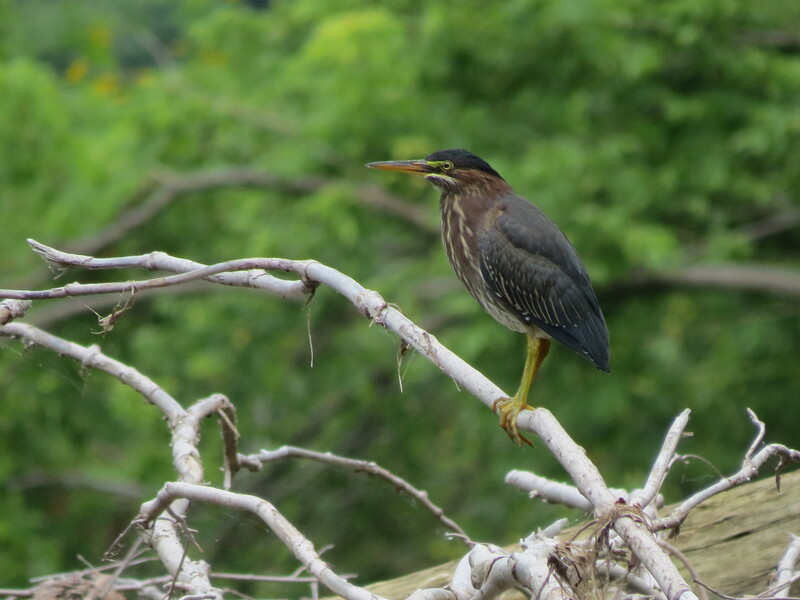 We saw at least a half-dozen green herons that day, including a few that followed us down the river for about a mile. Unlike their cousins, the great blue heron, they aren’t at all timid and we got within eight feet of them at times. Kingfishers were our constant companions throughout the trip. It seemed like you couldn’t swing a catfish without hitting one. We covered a little less than 10 miles that day, including the paddle across the west end of the lake. Our luck ran out about a half-mile away from our campsite. The rain caught up to us, but it had been a hot day so I didn’t bother putting on rain gear. As we drew closer to the campsite, we were welcomed by three osprey perched in a tree, probably juveniles that had fledged recently from a nearby nest. They put on a quite a show for us, circling overhead in the rain. Shortly after we landed, the rain stopped. Some campsites at Pleasant Hill Lake Park are easily accessed from the lake. Camping also is available downstream at the Mohican State Park campgrounds — the so-called class B campground at the covered bridge and the class A campground near State Route 3. Both have riverfront sites. We had plenty of company with the mosquitoes at our Pleasant Hill campsite. In the morning, we enjoyed a leisurely breakfast (except for the barnstorming lawnmower). This time I made my infamous veggie, egg and cheese medley — otherwise know as glop. After breakfast, we set out to paddle the most spectacular part of the river, Clear Fork Gorge. Here the river flows through a valley 300 feet deep and 1,000 feet wide and lined with mature forest and sandstone outcroppings. At the class B campground, the river flows beneath a covered bridge, one of many landmarks along Clear Fork. To get to this 4.8-mile stretch of river, we had to paddle a mile and a half across the eastern part of Pleasant Hill Lake — through a gauntlet of speedboats and jet skis. Pleasant Hill Dam is a relatively easy portage, especially with empty boats. It’s even easier in the winter, when you can ride your boat down to the river on the back side of the snow-covered earthen dam. There are islands on some of the river bends past the covered bridge. Deciding which side to paddle around can be a crap shoot because you can’t tell whether there are downed trees or strainers behind the islands until it’s too late. At low water, this isn’t a problem; at high water levels, it can get dicey. Paddling this section has been made easier by chutes formed by tourists piling rocks in the river. Kevin, Theresa and I couldn’t take full advantage of this because the river was jammed with dozens of children — and a few adults — floating along in inner tubes. Most were Mennonites, dressed in modest clothing. Paddling the Mohican River, especially on the crowded stretches, you expect to see people drifting lazily along in inner tubes. But this was another first for me, seeing inner tube after inner tube, each with two or three girls in their swimming dresses or boys in their calf-length trousers and buttoned shirts. You never know what to expect on the river — except for the unexpected. As we neared the end of our journey, a bald eagle took off from a tree limb overhanging the river and gracefully glided downstream. The river gods had smiled upon us again. At one egg per hen per day you could institute the “canoe coop” to transport the fresh eggs!! Maybe that was Ricky’s plan when he took a crate of live chickens on the river. Or maybe we really don’t want to know what his plans were. “Irv Oslin” has been included in our A Sunday Drive. Be assured that we hope this helps to point even more visitors in your direction. Thank you for including me in A Sunday Drive. When it comes to going for a Sunday drive — virtual or real — every day should be Sunday.